Century Motorsport are about to embark on their maiden weekend in the Protyre Motorsport Ginetta GT5 Challenge at Oulton Park this weekend. 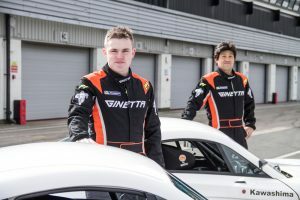 Having joined the team for the final round of the Ginetta GT Supercup in Brands Hatch last October, Japanese driver Osamu Kawashima returns to the team for his first full championship season in the UK in a Ginetta G40. “I drove the Ginetta for the first time at the test session on Media day. Because of a new car, we needed to adjust some points. In the last session, my car changed into the best condition with the great help of the team. I’m really excited about the entry into the Ginetta GT5 Challenge,” said Osamu. The 2014 Protyre Motorsport Ginetta GT5 Challenge begins at Oulton Park this weekend for rounds one, two and three on Saturday 19th April.